Shimano's Tokyo Urban Daypack has a low-profile yet functional design that's right at home in the city. The 23 L storage capacity is enough room to carry all your daily needs, and a padded laptop compartment plus separated stationary pockets make it easy to keep all your gear organized. A water-resistant ballistic nylon body makes the Tokyo Urban durable enough to handle the toils of everyday use, and the weather resistance is supplemented by taped zippers and a tarpaulin base. 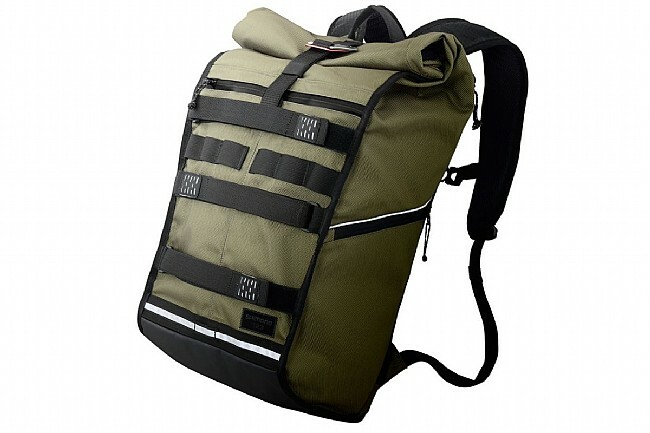 The roll top uses a versatile elastic hook closure for handling oversize objects, and multi-purpose loops on the side plus adjustable hook-and-loop bands on the back are great for carrying a lock and a helmet. The zippered side compartment is a perfect spot for regularly accessed items or a water bottle. An ergonomic back creates an air channel for great cooling all ride long, and the padded shoulders plus sternum strap keep the load properly adjusted and secure. Features reflective accents on all sides. Available in multiple colors. 23 L capacity. Claimed weight is 1425 g.
Plenty of room for whatever you need for the day. I commute with this bag, I travel with this bag I simply use this bag daily. I love it. A few features that you may not know about by looking at this bag - there is a water proof barrier which is located under the bag in it's own compartment. You remove it and wrap it around the bag and snap it in place. It works well and keep things dry. The other cool thing (one of which I did not realize until a few weeks back) is all of the pockets and features. I love compartments etc. There is one on the side that zips the length of the bag which allows access into the actual bag, the other which is located on teh other side is its on compartment - you can place documents and other items there which are not bulky but have the sizing of paper or documents. The part i discovered a few weeks ago is that on the bag there is a pouch where you can place pens, business cards, pass ports all that stuff. This is what I wanted, but didn't know I had. In fact I was looking for messenger bags to replace this for a trip I had a few weeks ago. When I saw that I was blown away. I should know my bag. Anyway, I am a huge fan. I also commute wiht this around 3 hours per day. Provided you dont saddle it up with 30 pounds of crap, like I sometimes do, the bag is comfortable and performs well. For the price listed here I would buy with confidence. With multiple access points and compartments, this bag is quickly becoming my favorite daily bag regardless of whether I am cycling or not.